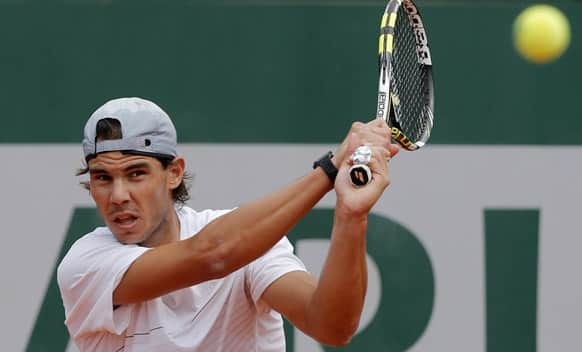 Spain's Rafael Nadal bites the cup afrer defeating compatriot David Ferrer in the men's final match of the French Open tennis tournament. 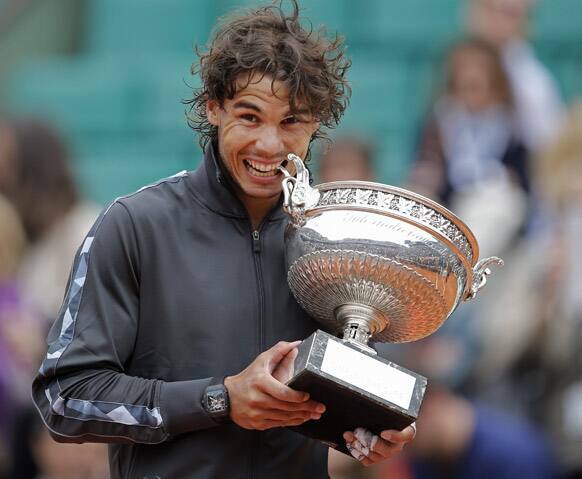 Spain's Rafael Nadal poses with the cup fo photographers after defeating compatriot David Ferrer in the men's final match of the French Open tennis tournament. 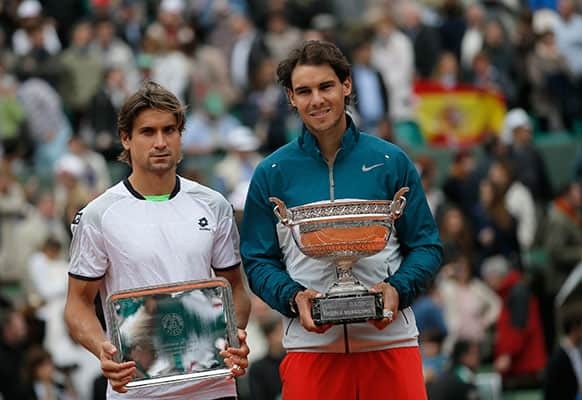 Spain's Rafael Nadal, right, and compatriot David Ferrer pose with their trophy after the men's final match of the French Open tennis tournament. 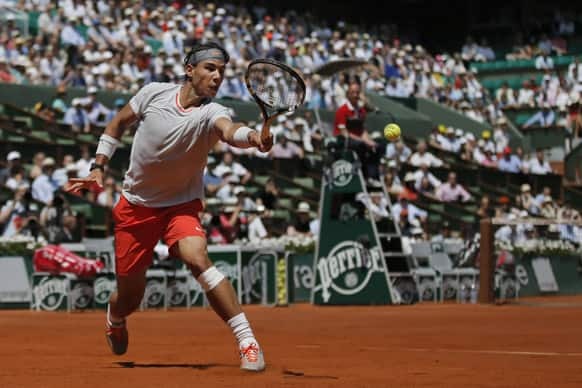 Spain's Rafael Nadal returns the ball to compatriot David Ferrer during the men's final match of the French Open tennis tournament at the Roland Garros stadium. 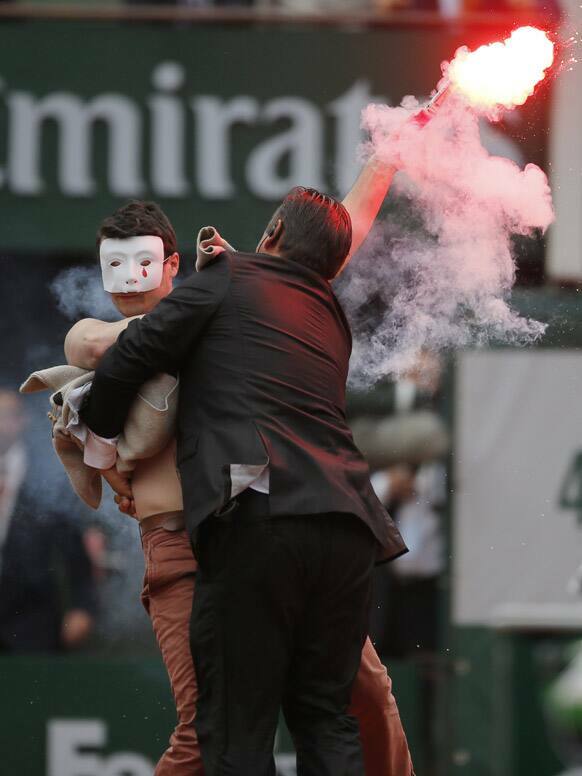 A security guard grabs a demonstrator as Spain's Rafael Nadal plays against compatriot David Ferrer in the final of the French Open tennis tournament, at Roland Garros stadium in Paris. 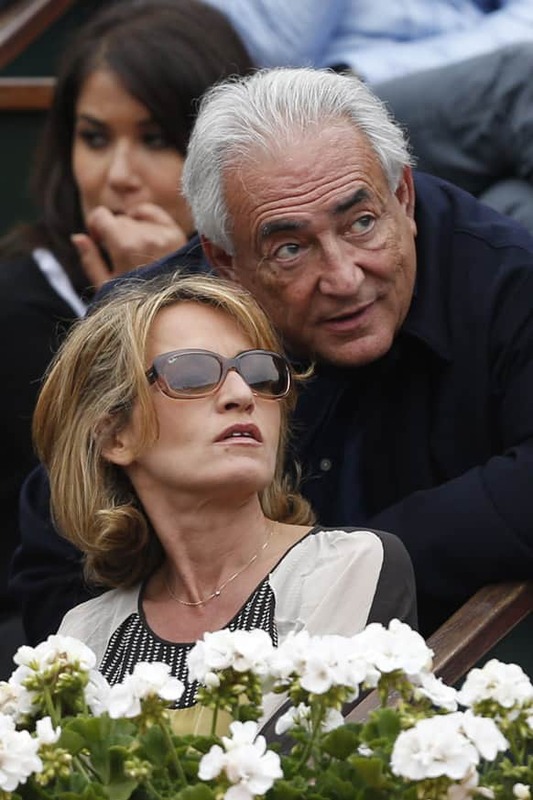 Former IMF Secretary General Dominique Strauss-Kahn, right, and his companion Myriam L'Aouffir watch Spain's Rafael Nadal playing compatriot David Ferrer during the men's final match of the French Open tennis tournament at the Roland Garros stadium. 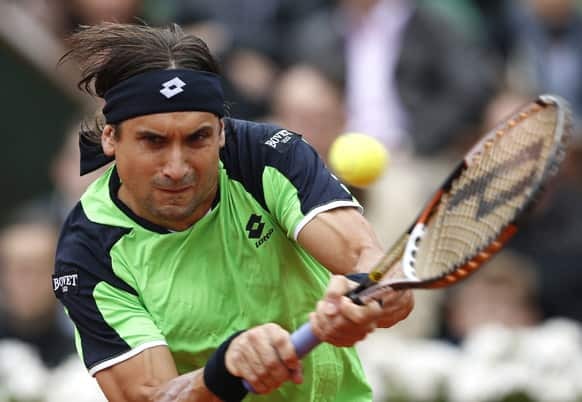 Spain's David Ferrer returns the ball to compatriot Rafael Nadal during the men's final match of the French Open tennis tournament at the Roland Garros stadium. Russia's Ekaterina Makarova, left, and Elena Vesnina kiss the trophy after defeating Italy's Sara Errani and Roberta Vinci in two sets 7-5, 6-2, in the women's doubles final of the French Open tennis tournament, at Roland Garros stadium in Paris. 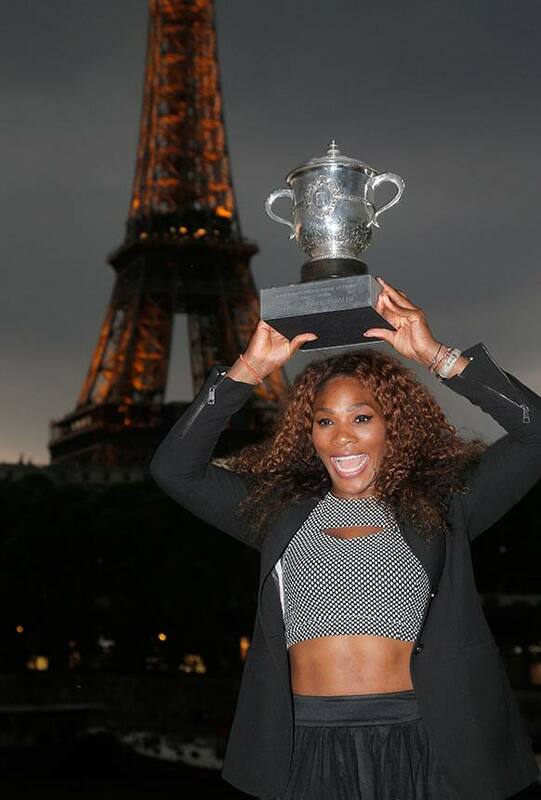 Serena Williams of the US poses with her trophy after defeating Russia's Maria Sharapova in two sets 6-4, 6-4, in the women's final of the French Open tennis tournament. Serena Williams of the US poses for the photographer with the trophy after defeating Russia's Maria Sharapova in two sets 6-4, 6-4, in the women's final of the French Open tennis tournament. Russia's Maria Sharapova holds the runner-up trophy after losing to Serena Williams of the US in two sets 4-6, 4-6, in the women's final of the French Open tennis tournament. 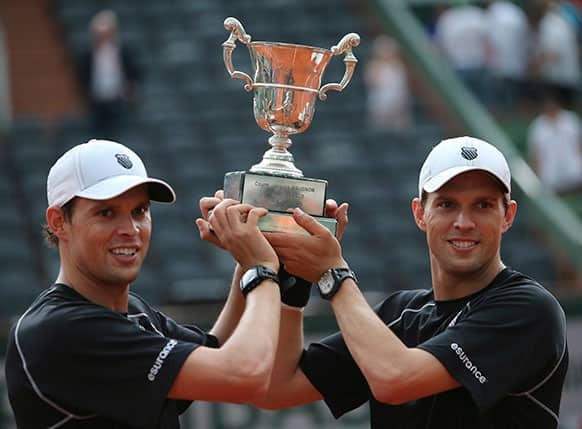 Bob, left, and Mike Bryan, of the US, holds the cup after defeating France's Michael Llodra and Nicolas Mahut in the men's double final match of the French Open tennis tournament. 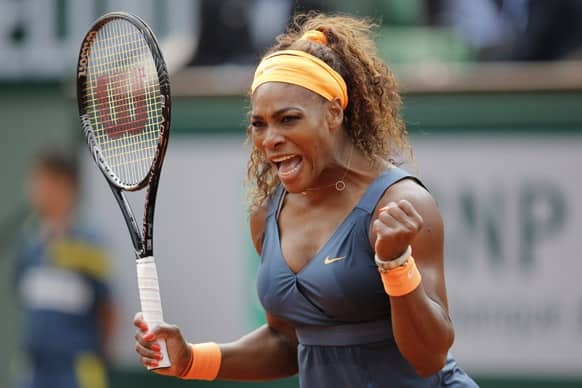 Serena Williams of the US returns against Russia's Maria Sharapova in the women's final of the French Open tennis tournament, at Roland Garros stadium in Paris. 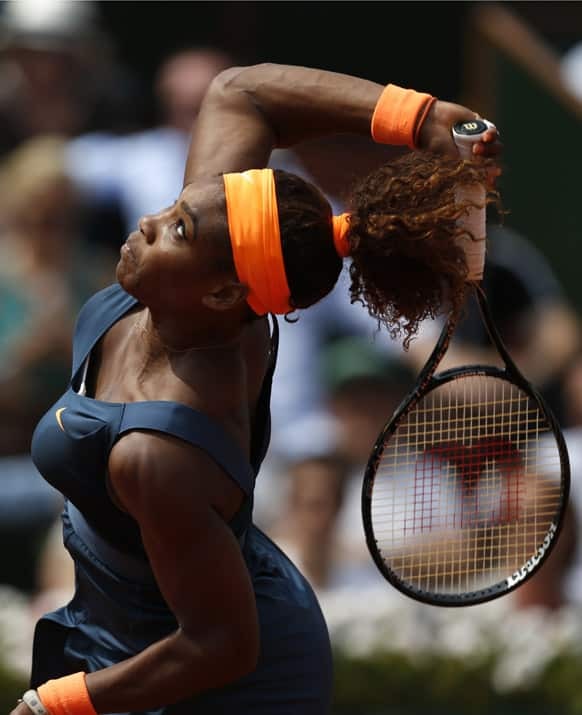 Serena Williams, of the US, serves the ball to Russia's Maria Sharapova during the Women's final match of the French Open tennis tournament at the Roland Garros stadium in Paris. Russia's Maria Sharapova returns against Serena Williams of the US in the women's final of the French Open tennis tournament, at Roland Garros stadium in Paris. 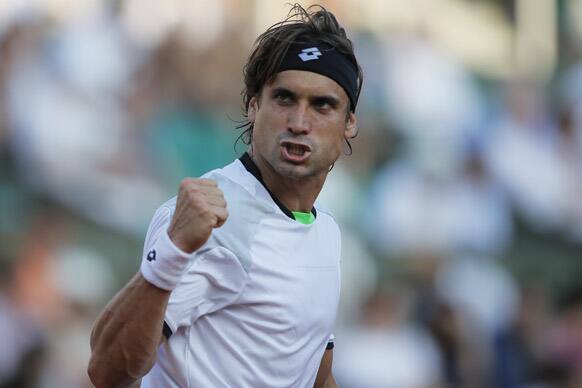 Spain's David Ferrer clenches his fist after scoring against Jo-Wilfried Tsonga of France, defeating in three sets 6-1, 7-6, 6-2, in their semifinal match at the French Open tennis tournament, at Roland Garros stadium in Paris. 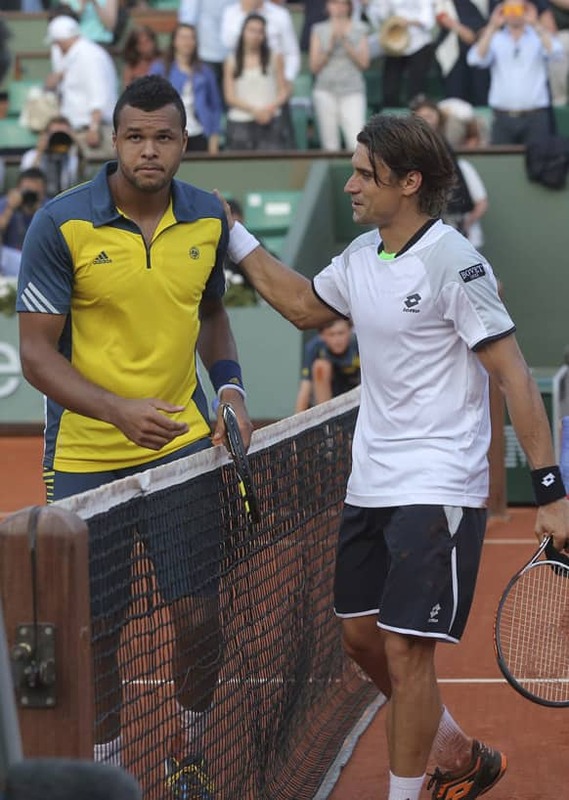 Spain's David Ferrer pats Jo-Wilfried Tsonga of France on the shoulder after defeating Tsonga in three sets 6-1, 7-6, 6-2, in their semifinal match at the French Open tennis tournament, at Roland Garros stadium in Paris. 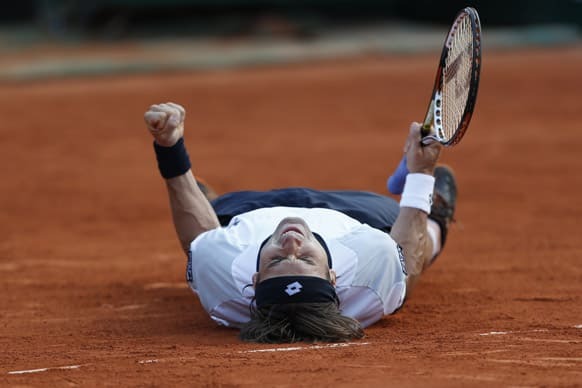 Spain's David Ferrer celebrates defeating Jo-Wilfried Tsonga of France in three sets 6-1, 7-6, 6-2, in their semifinal match at the French Open tennis tournament, at Roland Garros stadium in Paris. 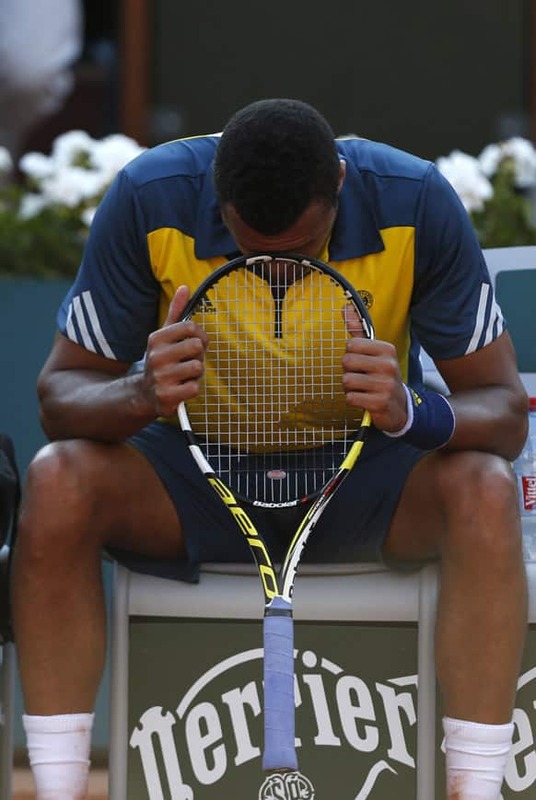 France's Jo-Wilfried Tsonga puts his racket to his forehead as he plays Spain's David Ferrer during their semifinal match of the French Open tennis tournament at the Roland Garros stadium in Paris. 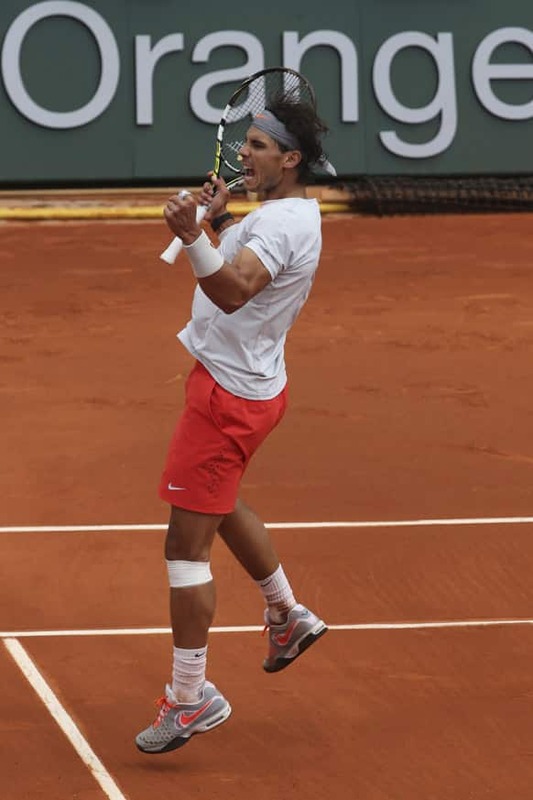 Spain's Rafael Nadal celebrates winning against Serbia's Novak Djokovic in their semifinal match at the French Open tennis tournament, at Roland Garros stadium in Paris. 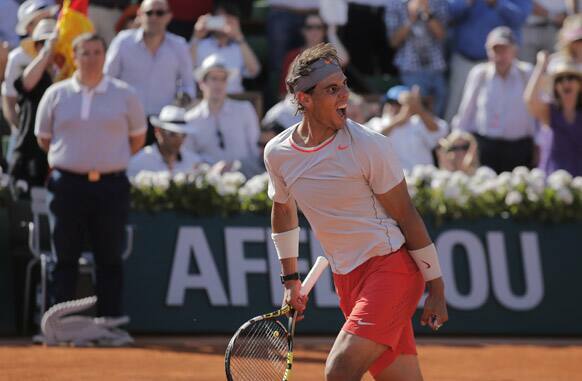 Nadal won in five sets 6-4, 3-6, 6-1, 6-7, 9-7. Spain's Rafael Nadal smiles as he defeats Serbia's Novak Djokovic during their semifinal match of the French Open tennis tournament at the Roland Garros stadium in Paris. 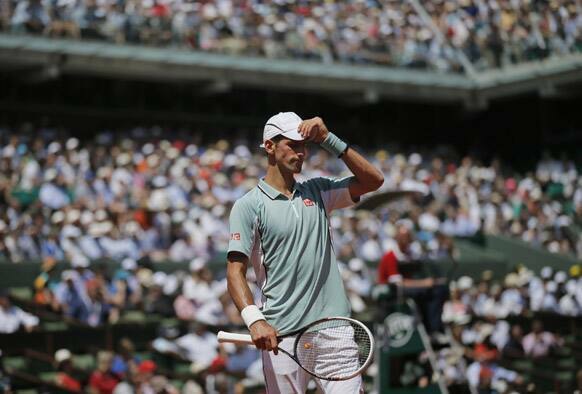 Serbia's Novak Djokovic blows a kiss to the public after losing to Spain's Rafael Nadal after their semifinal match of the French Open tennis tournament at the Roland Garros stadium in Paris. Spain's Rafael Nadal points as Serbia's Novak Djokovic touches the net when returning in the fifth set of their semifinal match at the French Open tennis tournament, at Roland Garros stadium in Paris. 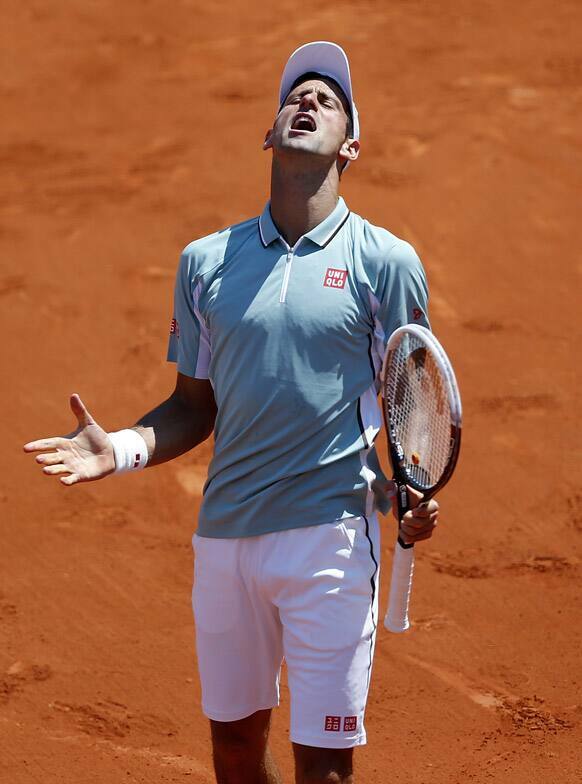 Serbia's Novak Djokovic reacts as he plays Spain's Rafael Nadal during their semifinal match of the French Open tennis tournament at the Roland Garros stadium in Paris. Spain's Rafael Nadal returns the ball to Serbia's Novak Djokovic during their semifinal match of the French Open tennis tournament at the Roland Garros stadium in Paris. Serbia's Novak Djokovic adjusts his cap in his semifinal match against Spain's Rafael Nadal at the French Open tennis tournament, at Roland Garros stadium in Paris. 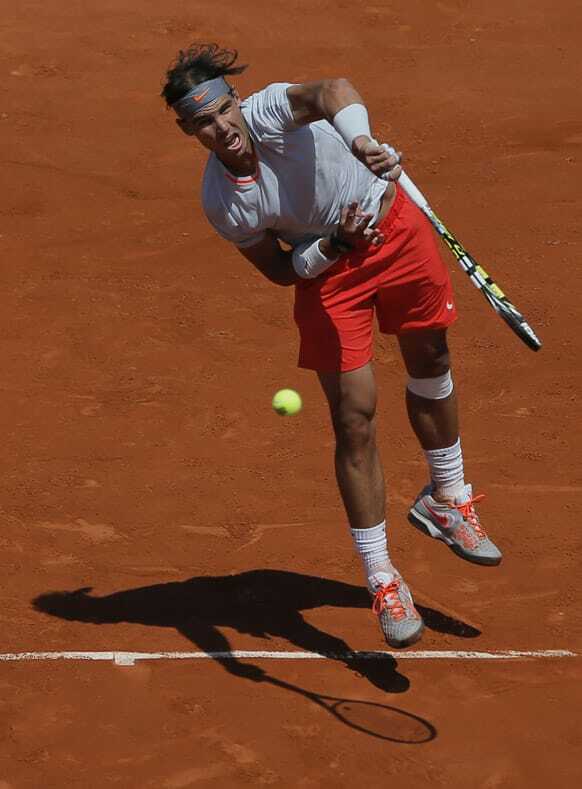 Spain's Rafael Nadal returns against Serbia's Novak Djokovic in their semifinal match at the French Open tennis tournament, at Roland Garros stadium in Paris. 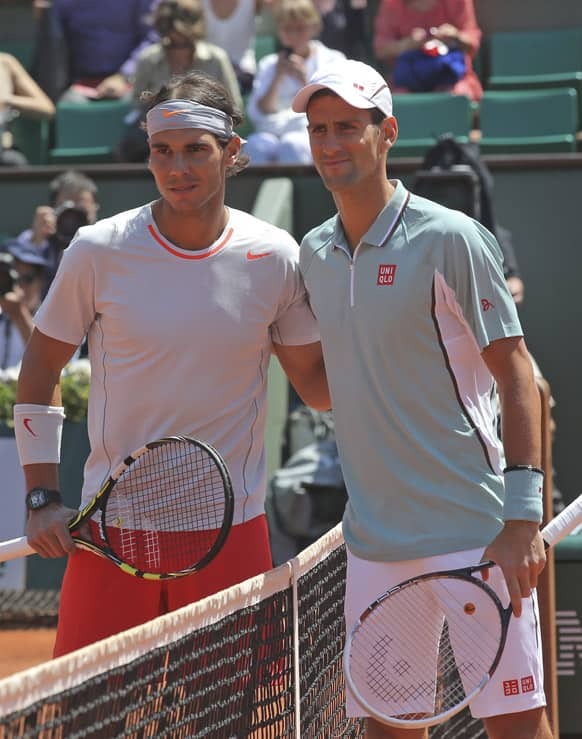 Spain's Rafael Nadal and Serbia's Novak Djokovic pose for photographers prior to their semifinal match at the French Open tennis tournament, at Roland Garros stadium in Paris. Serena Williams, of the US, reacts as she plays Italy’s Sara Errani during their semifinal match of the French Open tennis tournament at the Roland Garros stadium, in Paris. Italy's Sara Errani returns against Serena Williams of the US in their semifinal match at the French Open tennis tournament, at Roland Garros stadium in Paris. Russia's Maria Sharapova reacts as she defeats Belarus' Victoria Azarenka during their semifinal match of the French Open tennis tournament at the Roland Garros stadium . Belarus’ Victoria Azarenka reacts as she plays Russia’s Maria Sharapova during their semifinal match of the French Open tennis tournament at the Roland Garros stadium. 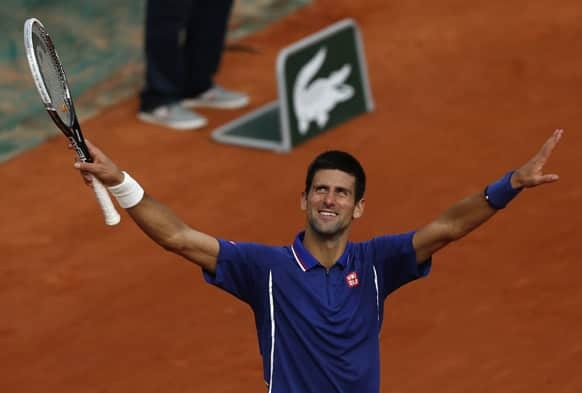 Novak Djokovic celebrates defeating Germany's Tommy Haas in three sets 6-3, 7-6, 7-5, in their quarterfinal match at the French Open tennis tournament, at Roland Garros stadium in Paris. 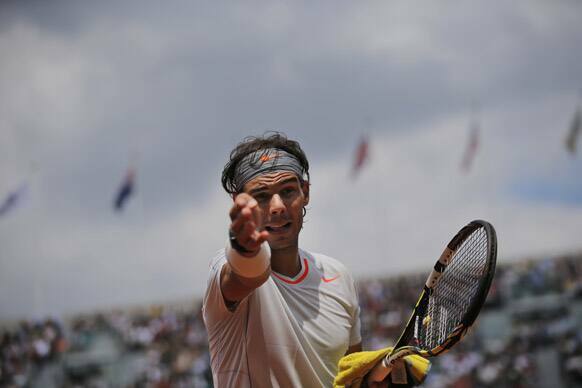 Spain's Rafael Nadal reacts after defeating Switzerland's Stanisas Wawrinka during their quarterfinal match of the French Open tennis tournament at the Roland Garros stadium in Paris. Nadal won 6-2, 6-3, 6-1. 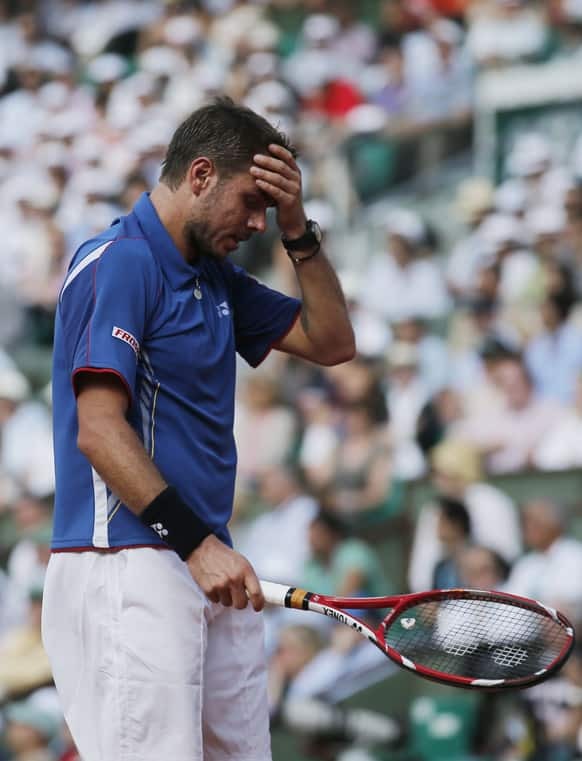 Switzerland's Stanisas Wawrinka holds his head as he plays Spain's Rafael Nadal during their quarterfinal match of the French Open tennis tournament at the Roland Garros stadium in Paris. 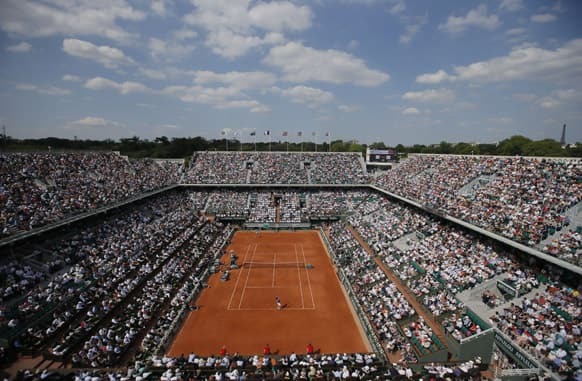 View of center court where Spain's Rafael Nadal plays against Switzerland's Stanislas Wawrinka in their quarterfinal match at the French Open tennis tournament, at Roland Garros stadium in Paris. 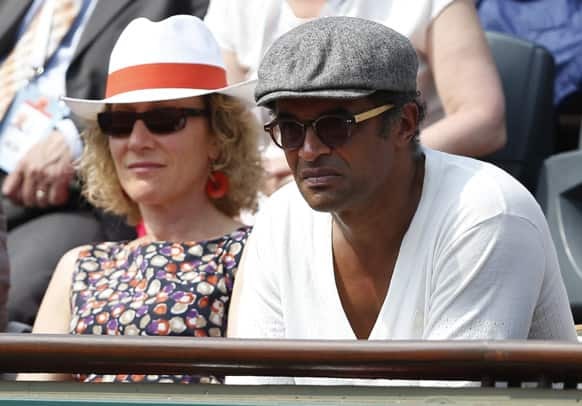 Former Roland Garros winner and musician Yannick Noah watches Russia's Maria Sharapova defeat Serbia's Jelena Jankovic in three sets 0-6, 6-4, 6-3, in their quarterfinal match at the French Open tennis tournament, at Roland Garros stadium in Paris. 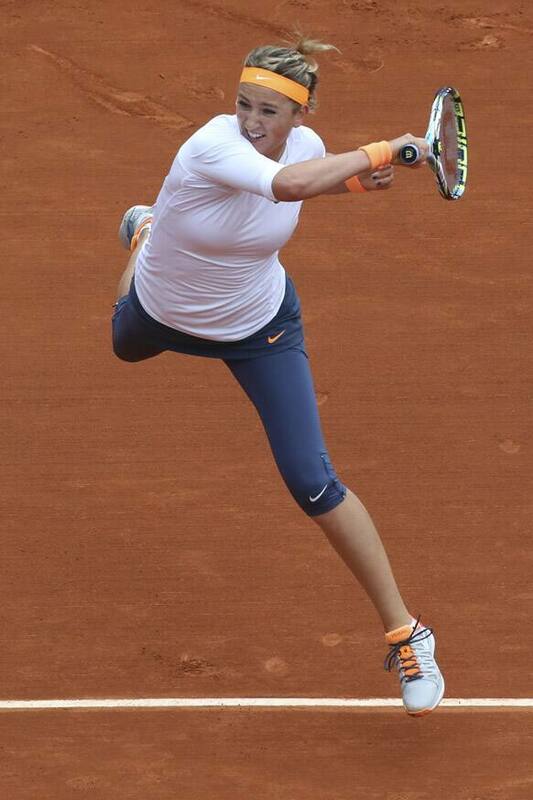 Russia's Maria Sharapova celebrates winning against Serbia's Jelena Jankovic in three sets 0-6, 6-4, 6-3, in their quarterfinal match at the French Open tennis tournament, at Roland Garros stadium in Paris. Victoria Azarenka of Belarus celebrates scoring against Russia's Maria Kirilenko in their quarterfinal match at the French Open tennis tournament, at Roland Garros stadium in Paris. Azarenka won in two sets 7-6, 6-2. 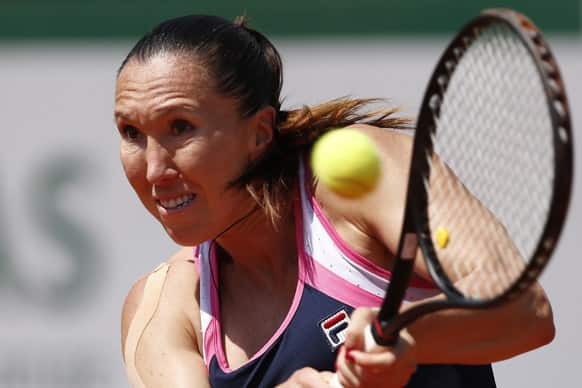 Serbia's Jelena Jankovic returns against Russia's Maria Sharapova in their quarterfinal match at the French Open tennis tournament, at Roland Garros stadium in Paris. Serbia's Jelena Jankovic slips in her quarterfinal match against Russia's Maria Sharapova at the French Open tennis tournament, at Roland Garros stadium in Paris. 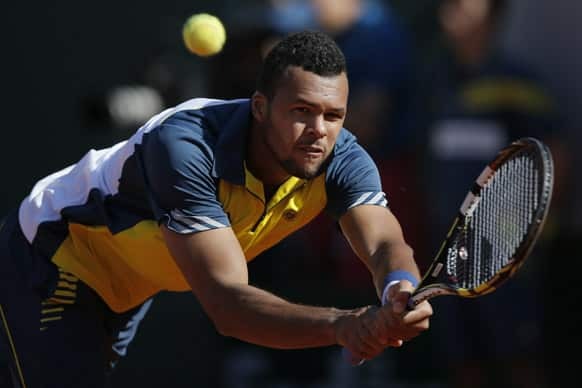 France's Jo-Wilfried Tsonga returns against Switzerland's Roger Federer, defeating Federer in three sets 7-5, 6-3, 6-3, in their quarterfinal match at the French Open tennis tournament, at Roland Garros stadium in Paris. 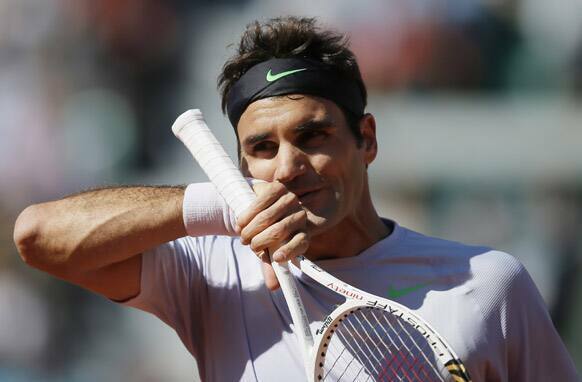 Switzerland's Roger Federer wipes his face as he plays France's Jo-Wilfried Tsonga during their quarterfinal match of the French Open tennis tournament at the Roland Garros stadium in Paris. 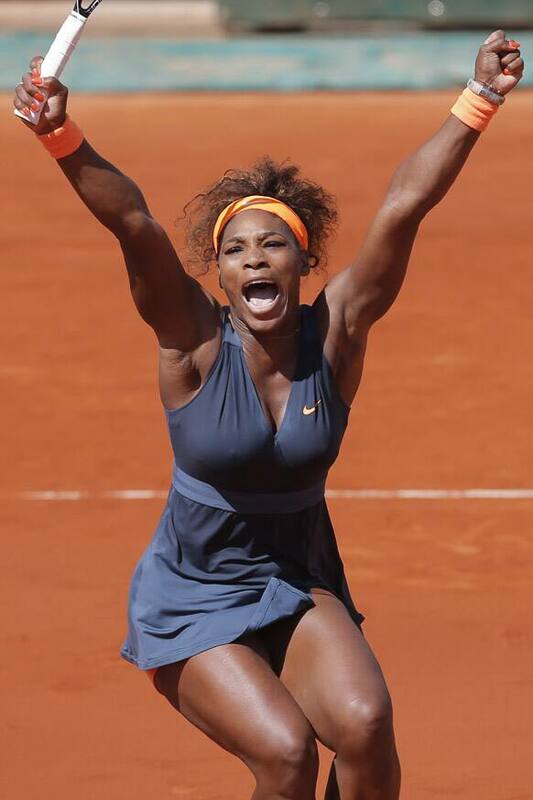 Serena Williams of the US celebrates winning against Russia's Svetlana Kuznetsova in three sets 6-1, 3-6, 6-3, in their quarterfinal match at the French Open tennis tournament, at Roland Garros stadium in Paris. Poland's Agnieszka Radwanska clenches her fist as she defeats Serbia's Ana Ivanovic during their fourth round match of the French Open tennis tournament at the Roland Garros stadium. 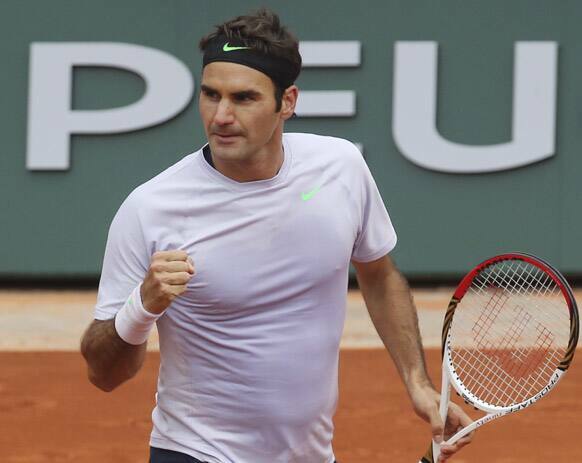 Switzerland's Roger Federer celebrates after defeating France's Gilles Simon in five sets 6-1, 4-6, 2-6, 6-2, 6-3, in their fourth round match at the French Open tennis tournament, at Roland Garros stadium in Paris. 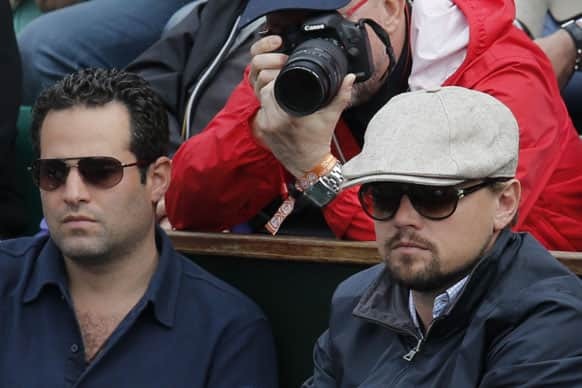 Actor Leonardo DiCaprio, right, watches the fourth round match of Switzerland's Roger Federer against France's Gilles Simon at the French Open tennis tournament, at Roland Garros stadium in Paris. 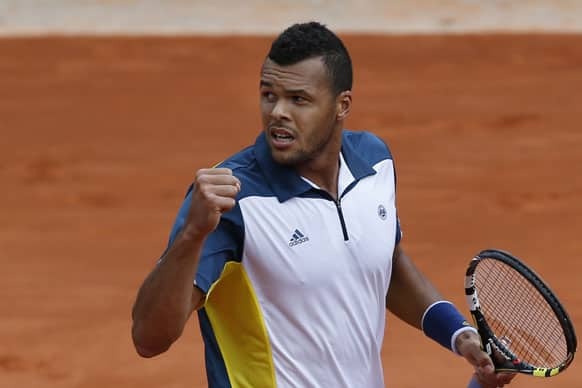 Jo-Wilfried Tsonga of France clenches his fist after scoring against Serbia's Viktor Troicki in their fourth round match at the French Open tennis tournament, at Roland Garros stadium in Paris. 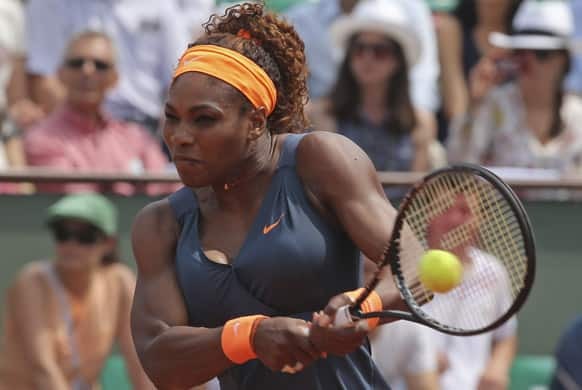 Serena Williams of the US serves against Italy's Roberta Vinci in their fourth round match at the French Open tennis tournament, at Roland Garros stadium in Paris. 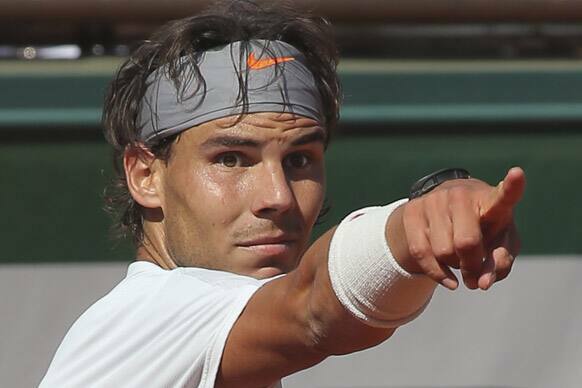 Defending champion Spain's Rafael Nadal clenches his fist as he plays Italy's Fabio Fognini during their third round match of the French Open tennis tournament at the Roland Garros stadium. Russia's Maria Sharapova returns the ball to China's Jie Zheng during their third round match of the French Open tennis tournament at the Roland Garros stadium. Bethanie Mattek-Sands, of the US, waves to the public after defeating Argentina's Paula Ormaechea during their third round match of the French Open tennis tournament at the Roland Garros stadium. Victoria Azarenka of Belarus celebrates scoring a point against Alize Cornet of France in their third round match at the French Open tennis tournament, at Roland Garros stadium in Paris. Serbia's Ana Ivanovic returns against Virginie Razzano of France in their third round match at the French Open tennis tournament, at Roland Garros stadium in Paris. 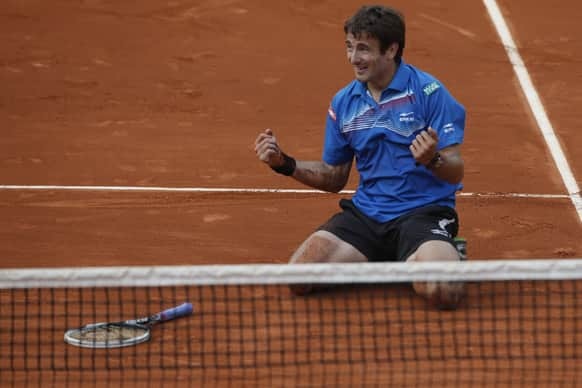 Tommy Robredo of Spain celebrates defeating Gael Monfils of France in their third round match at the French Open tennis tournament, at Roland Garros stadium in Paris. Robredo won in five sets 2-6, 6-7, 6-2, 7-6, 6-2. Switzerland's Stefanie Voegele celebrates defeating Estonia's Kaia Kanepi in their second round match at the French Open tennis tournament, at Roland Garros stadium in Paris. Voegele won in three sets 7-3, 3-6, 8-6. 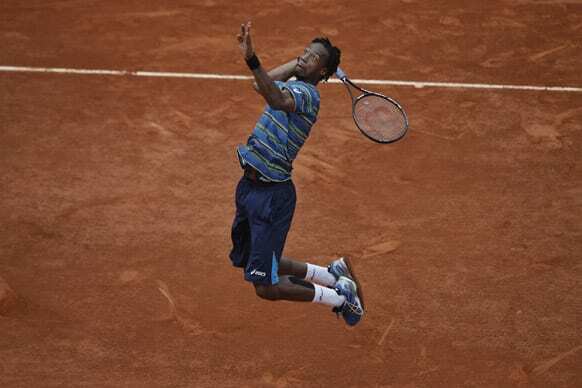 Gael Monfils of France jumps to return against Tommy Robredo of Spain in their third round match at the French Open tennis tournament, at Roland Garros stadium in Paris. 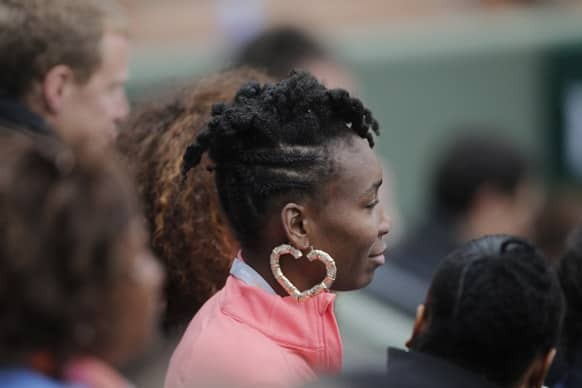 Venus Williams of the US watches her sister Serena's third round match against Sorana Cirstea of Romania at the French Open tennis tournament, at Roland Garros stadium in Paris. 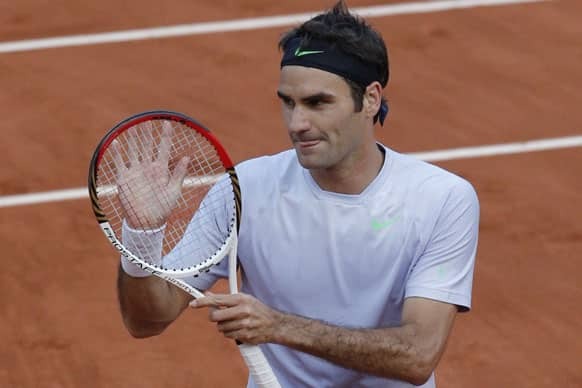 Switzerland's Roger Federer clenches his fist after scoring a point against Julien Benneteau of France in their third round match at the French Open tennis tournament, at Roland Garros stadium in Paris. 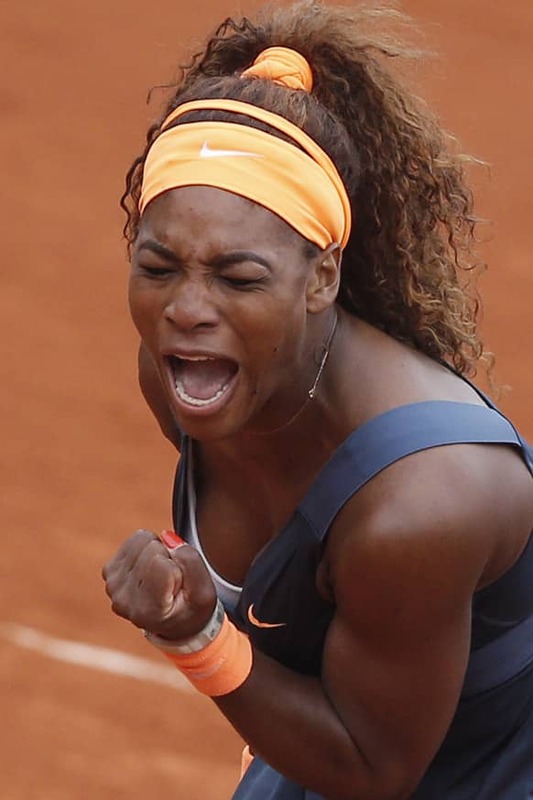 Serena Williams of the US celebrates scoring a point against Sorana Cirstea of Romania in their third round match at the French Open tennis tournament, at Roland Garros stadium in Paris. 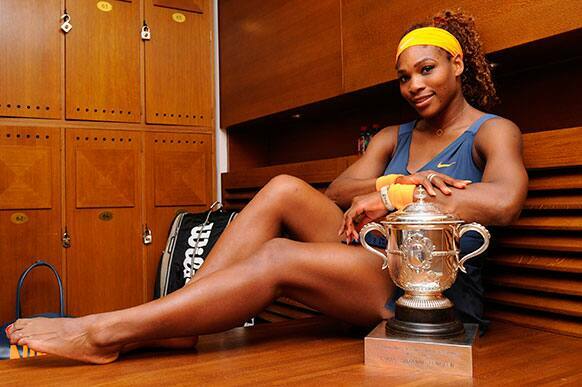 Williams won in two sets 6-0, 6-2. Sorana Cirstea of Romania returns against Serena Williams of the US in their third round match at the French Open tennis tournament, at Roland Garros stadium in Paris. 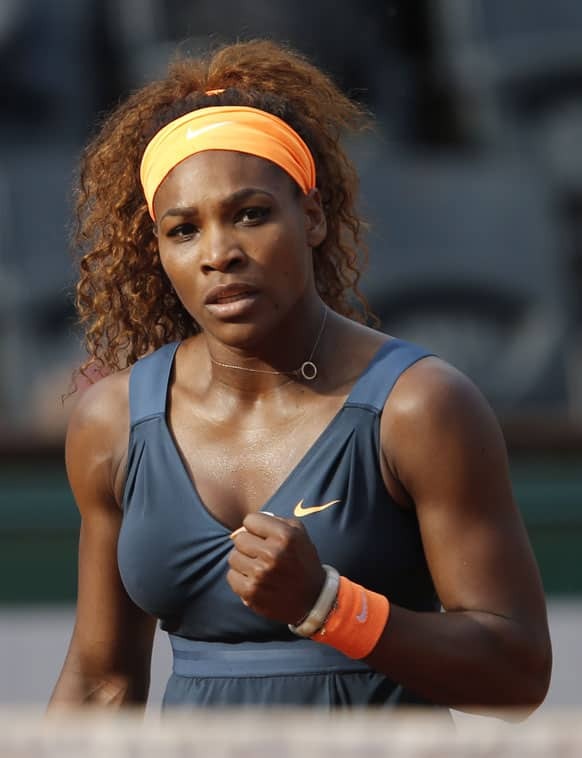 Serena Williams of the returns against Sorana Cirstea of Romania in their third round match at the French Open tennis tournament, at Roland Garros stadium in Paris. 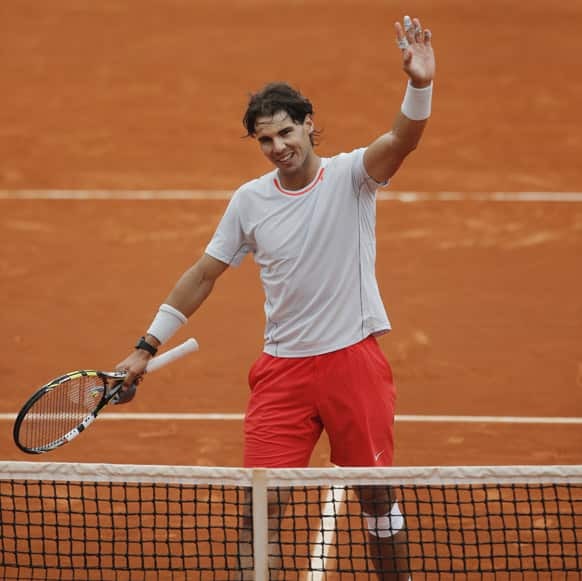 Spain's Rafael Nadal celebrates defeating Slovakia's Martin Klizan in their second round match at the French Open tennis tournament, at Roland Garros stadium in Paris. 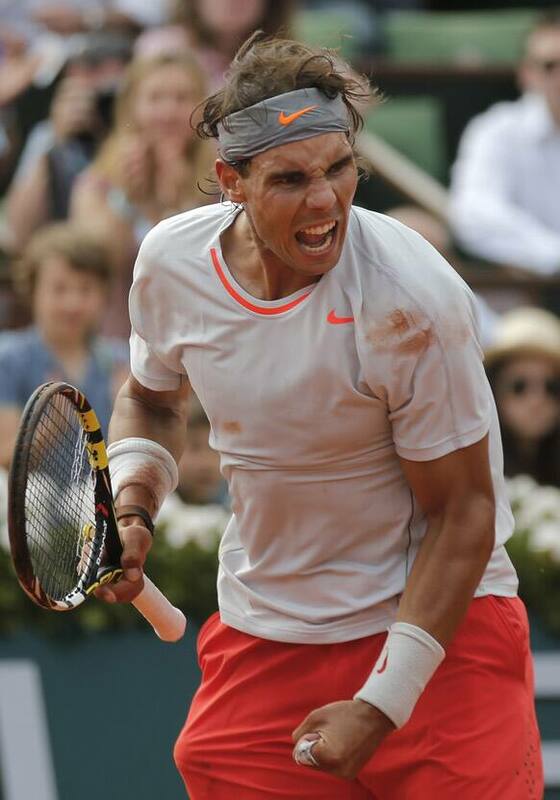 Nadal won in four sets 4-6, 6-3, 6-3, 6-3. Russia's Maria Sharapova greets spectators after winning her second round match against Canada's Eugenie Bouchard at the French Open tennis tournament, at Roland Garros stadium in Paris. Russia's Maria Sharapova returns against Canada's Eugenie Bouchard in their second round match at the French Open tennis tournament, at Roland Garros stadium in Paris. 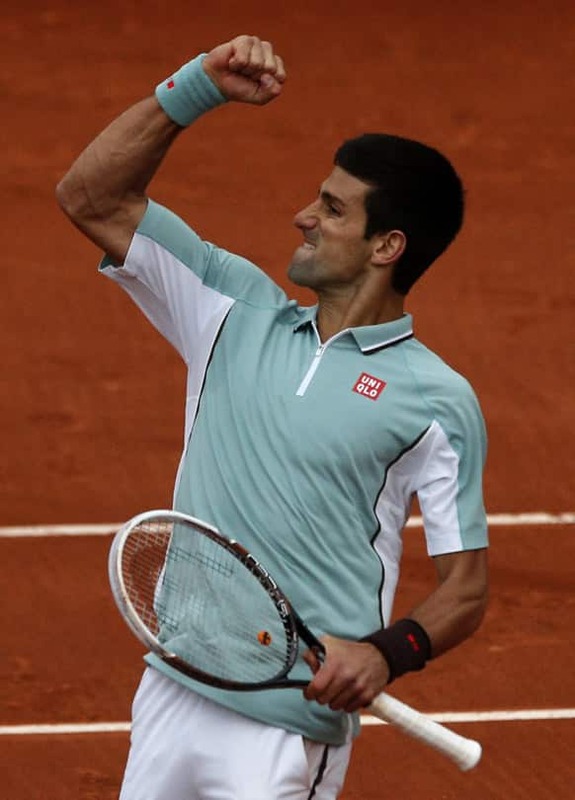 Serbia's Novak Djokovic mimics pushing the rain clouds away shortly before defeating Argentina's Guido Pella during their second round match of the French Open tennis tournament at the Roland Garros stadium in Paris. Djokovic won 6-2, 6-0, 6-2. Victoria Azarenka of Belarus returns against Germany's Annika Beck in their second round match at the French Open tennis tournament, at Roland Garros stadium in Paris. 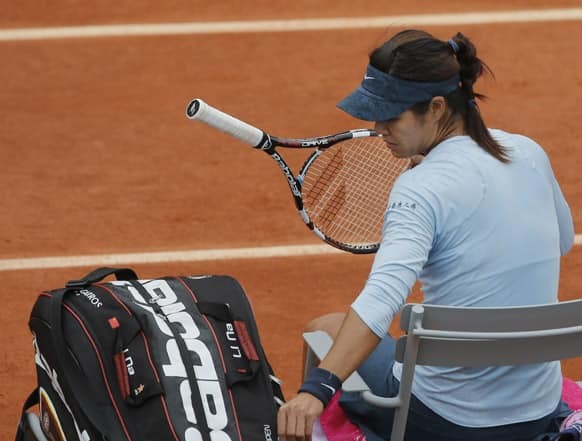 China's Li Na puts her racket away during a break because of light rain in the second round match against Bethanie Mattek-Sands of the U.S. at the French Open tennis tournament, at Roland Garros stadium in Paris. Mattek-Sands won in three sets 6-1, 5-7, 6-4. 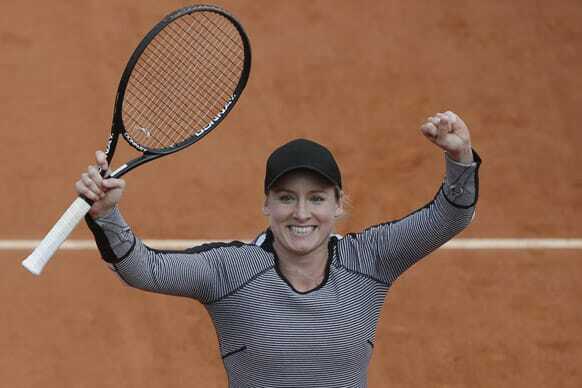 Bethanie Mattek-Sands of the US celebrates defeating China's Li Na in their second round match at the French Open tennis tournament, at Roland Garros stadium in Paris. Mattek-Sands won in three sets 6-1, 5-7, 6-4. 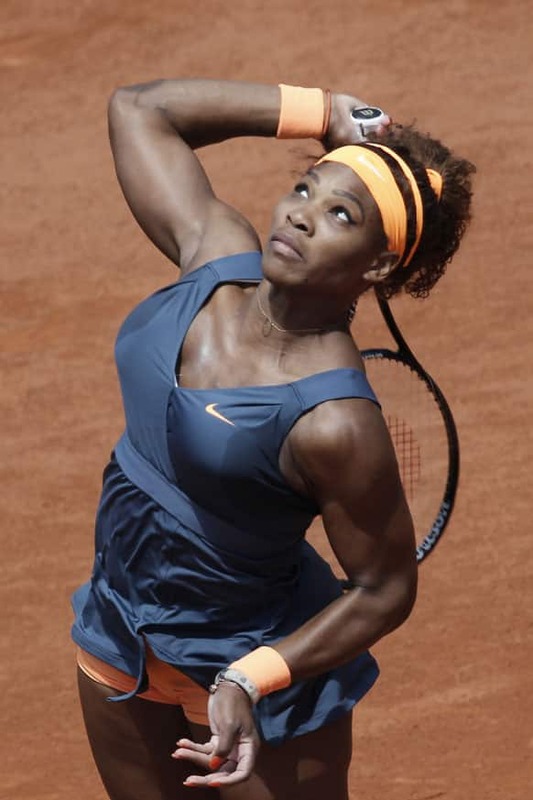 Serena Williams of the US celebrates scoring a point against Caroline Garcia of France in their second round match of the French Open tennis tournament, at Roland Garros stadium in Paris. 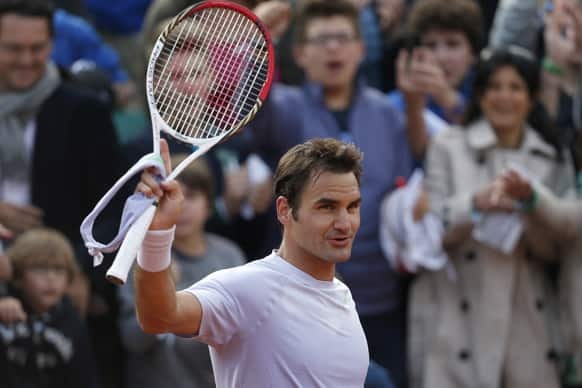 Switzerland's Roger Federer greets spectators after defeating India's Somdev Devvarman in their second round match of the French Open tennis tournament, at Roland Garros stadium in Paris. Denmark's Caroline Wozniacki returns the ball to Serbia's Bojana Jovanovski during their second round match of the French Open tennis tournament at the Roland Garros stadium. 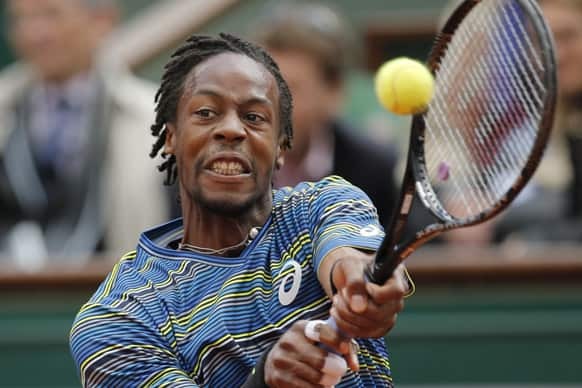 France's Gael Monfils returns against Latvia's Ernests Gulbis in their second round match of the French Open tennis tournament, at Roland Garros stadium in Paris. 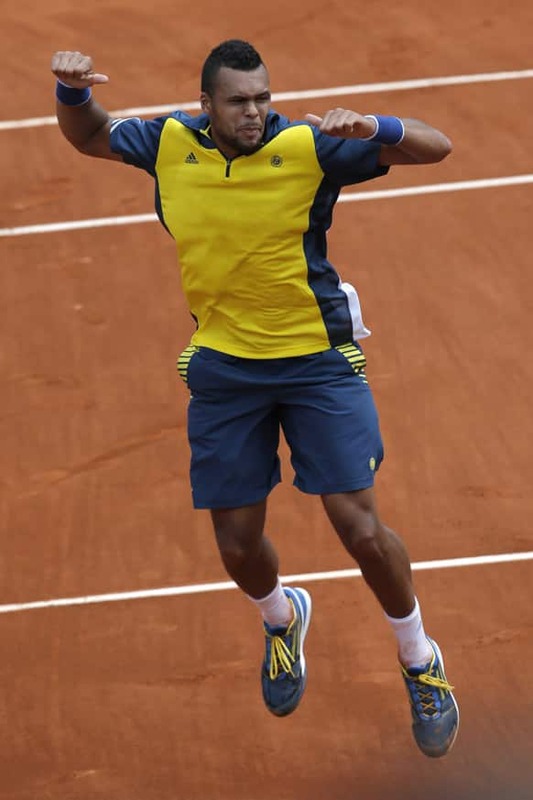 France's Jo-Wilfried Tsonga celebrates winning against Finland's Jarkko Nieminen in their second round match of the French Open tennis tournament, at Roland Garros stadium in Paris. Poland's Agnieszka Radwanska returns the ball to Mallory Burdette, of the US, during their second round match of the French Open tennis tournament at the Roland Garros stadium. Serbia's Novak Djokovic reacts as he defeats Belgium's David Goffin during their first round match of the French Open tennis tournament at the Roland Garros stadium . Australia's Samantha Stosur returns the ball to Japan's Kimiko Date-Krumm during their first round match of the French Open tennis tournament at the Roland Garros stadium. 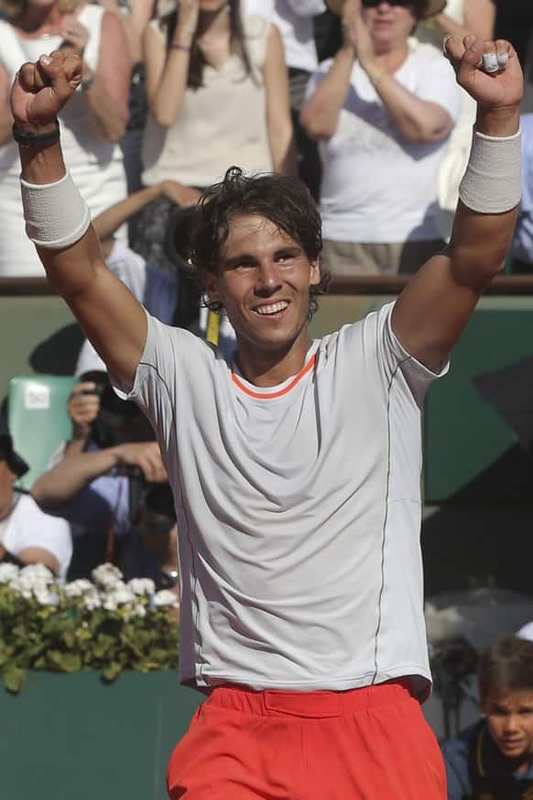 Spain's Rafael Nadal celebrates defeating Germany's Daniel Brands in their first round match of the French Open tennis tournament, at Roland Garros stadium in Paris. Nadal won in four sets 4-6, 7-6, 6-4, 6-3. Russia's Maria Sharapova greets spectators after defeating Su-Wei Hsieh of Taipei in their first round match of the French Open tennis tournament, at Roland Garros stadium in Paris. 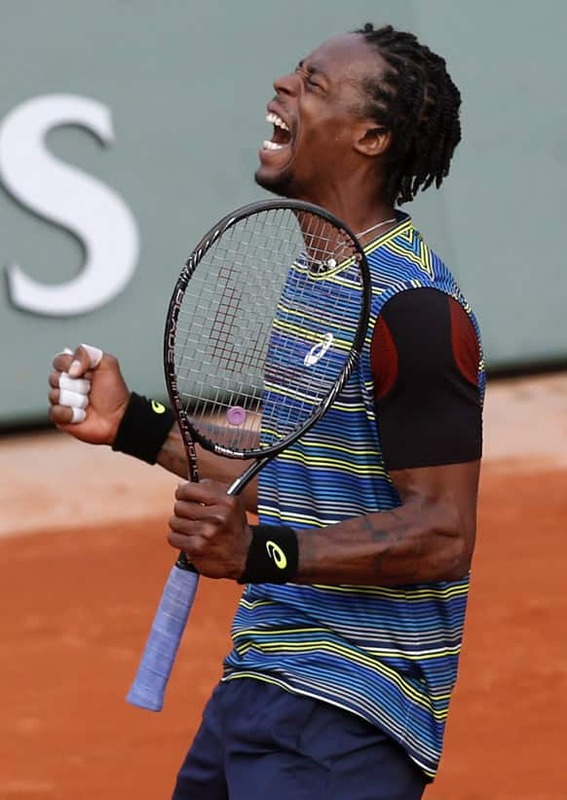 France's Gael Monfils reacts shortly before defeating Czech Republic's Tomas Berdych during their first round match of the French Open tennis tournament at the Roland Garros stadium in Paris. 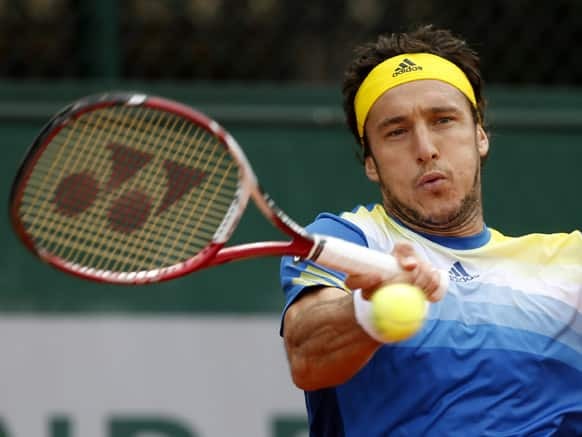 Argentina's Juan Monaco returns the ball to Spain's Daniel Gimeno Traver during their first round match of the French Open tennis tournament at the Roland Garros stadium in Paris. 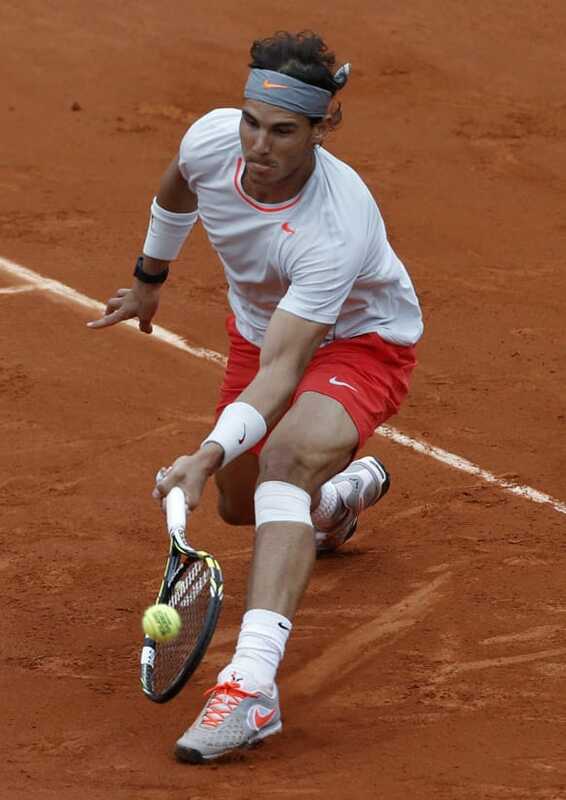 Spain's Rafael Nadal asks for the ball after it rolled into an underground press position in his first round match against Germany's Daniel Brands at the French Open tennis tournament at the Roland Garros stadium in Paris. 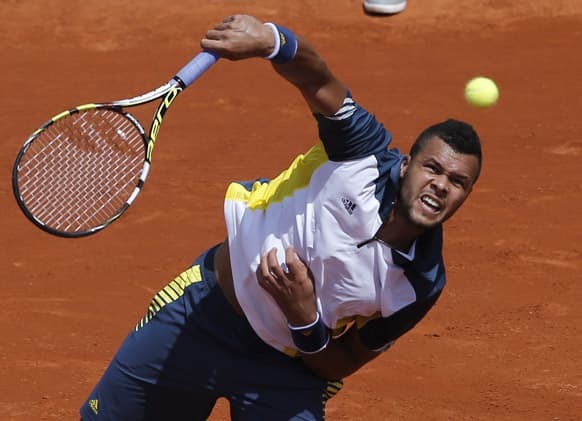 France's Jo-Wilfried Tsonga serves the ball to Slovenia's Aljaz Bedene during their first round match of the French Open tennis tournament at the Roland Garros stadium in Paris. Tsonga won 6-2, 6-2, 6-3. China's Li Na clenches her fist as she defeats Spain's Anabel Medina Garrigues during their first round match of the French Open tennis tournament at the Roland Garros stadium in Paris. 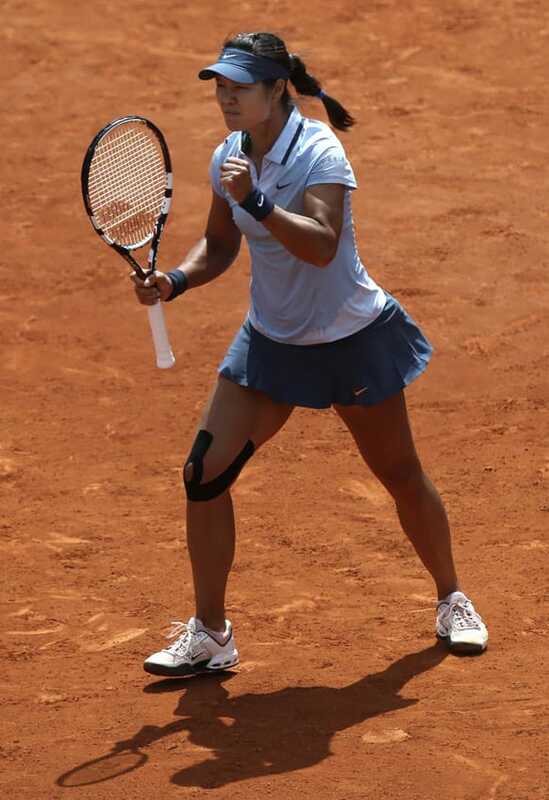 Li Na won 6-3, 6-4. Venus Williams of the US, congratulates Poland's Urszula Radwanska with her first round match win of the French Open tennis tournament, at Roland Garros stadium in Paris. Serena Williams of the US returns against Georgia's Anna Tatishvili in their first round match of the French Open tennis tournament, at Roland Garros stadium in Paris. 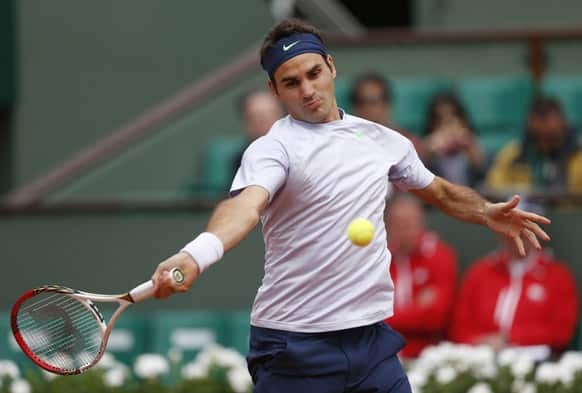 Switzerland's Roger Federer returns the ball to Spain's Pablo Carreno Busta during their first round match of the French Open tennis tournament at the Roland Garros stadium in Paris. Defending champion Rafael Nadal, of Spain, returns the ball during a training session for the French Open tennis tournament at the Roland Garros stadium. 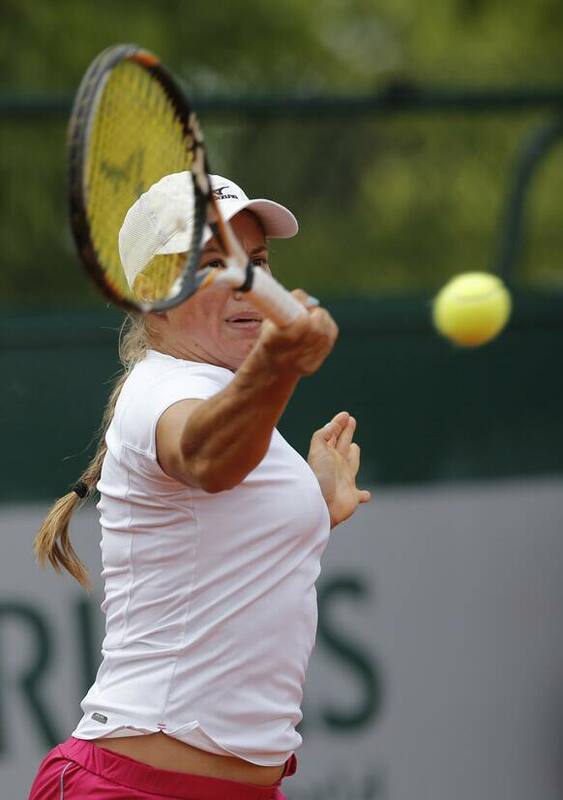 Kazakhstan's Yulia Putintseva returns the ball to Japan's Ayumi Morita during their first round match of the French Open tennis tournament at the Roland Garros stadium in Paris. Spain's Rafael Nadal, Head of the French Tennis Federation, Jean Gachassin and Russia's Maria Sharapova pose during the draw for the 2013 French Open tennis tournament, at Roland Garros stadium in Paris. 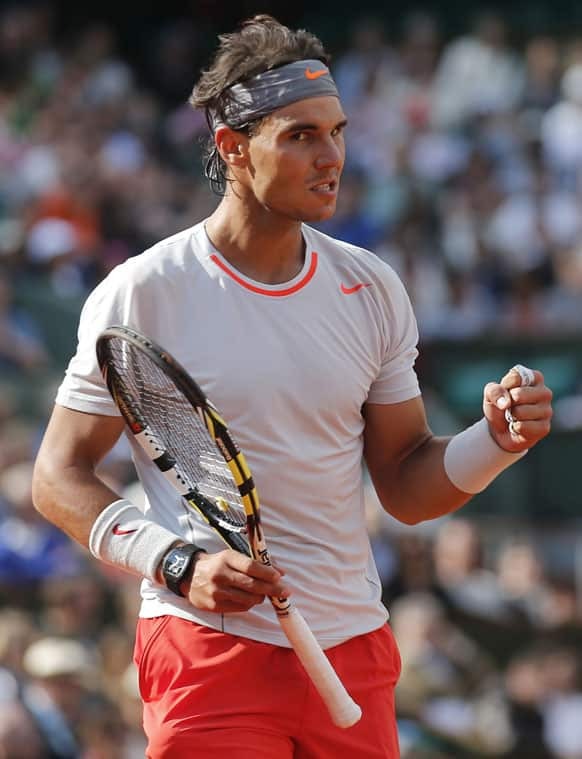 Spain's Rafael Nadal attends the draw for the 2013 French Open tennis tournament, at Roland Garros stadium in Paris. Russia's Maria Sharapova listens to a reporter during a press conference for the 2013 French Open tennis tournament, at Roland Garros stadium in Paris. 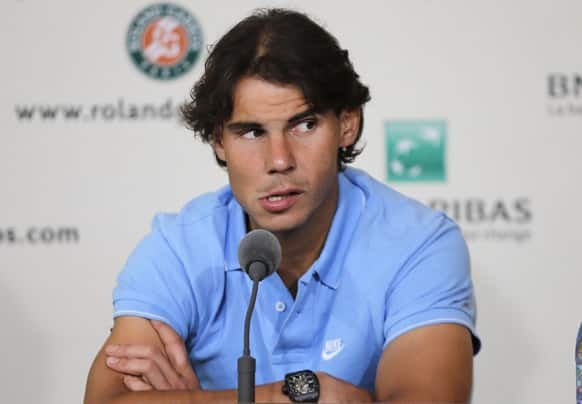 Spain's Rafael Nadal listens to a reporter during a press conference for the 2013 French Open tennis tournament, at Roland Garros stadium in Paris. 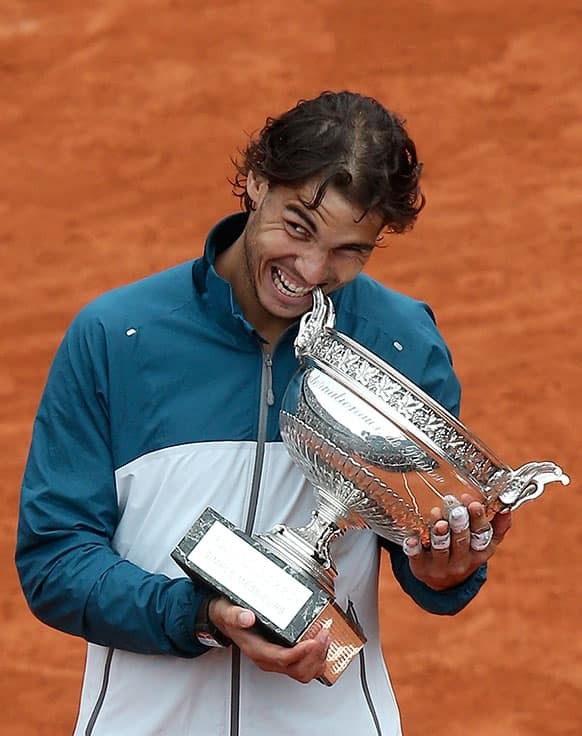 FILE In this June 11, 2012 file photo, Rafael Nadal of Spain bites the trophy after winning the mens final match against Novak Djokovic of Serbia at the French Open tennis tournament in Roland Garros stadium in Paris.